In our last piece we discussed the three key techniques used by southpaw fighters and the best way a class should be structured to deal with southpaws. What we didn’t cover is how the simple action of moving to the left or the right can open up opportunities for attack. Conventional wisdom today is that against a southpaw you should always be moving to your left, towards their jabbing hand and away from their left. That is conventional wisdom, but in practise will make your footwork predictable. A good southpaw, or orthodox fighting one, will have to be competent fighting from both left and right angles. While last time we looked at Giorgio Petrosyan, today we will be looking mostly at the orthodox (but left handed) fighter, Miguel Cotto in his bouts against Manny Pacquaio and Sergio Martinez. The combination while stepping through to the outside hides the left hook to the head, which comes from a blind angle. Pacquaio, arguably the greatest of his generation, took that same angle time and time again against Miguel Cotto until his eventual victory. Manny was adept at fighting on both inside and outside angles, but in this fight every time Cotto fired his cannon of a jab, Pacquaio had taken the outside angle and countered. Here Pacquaio uses the outside angle for effective defence. Pressed against the ropes by the bigger boxer – Pacquaio takes the outside angle, pivots round and quickly goes back on the offensive. Despite this, when Miguel Cotto fought Sergio Martinez, years later, he had learned what to do when presented with an inside angle. In using this inside angle (and outside angle) so effectively, he also succeeded to shut down Sergio Martinez and prevent him from doing… anything really. 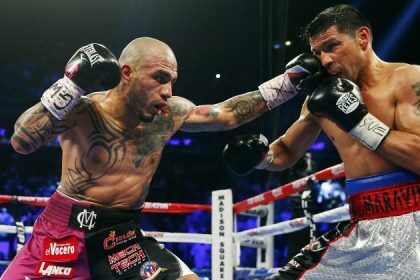 What made this performance so impressive, was that Miguel Cotto found himself against a champion who excelled at not only outside, but inside angles. Sergio Martinez was always crucially aware of what techniques were available to him depending on what angle his opponent presented him with. While orthodox fighters are typically taught to step to to the outside, Sergio Martinez made a career of punishing boxers who took that favoured angle. The first round showed this concept at it’s most effective when Sergio wasn’t at all expecting it. Being knocked down three times in the first round would have meant a first round TKO in anything but a title bout – and amazingly after such a hellish first round, Martinez lasted all the way to the 10th round before retiring from both the fight and sport. Miguel Cotto, famously good at jabs and left hooks, frequently goes to the inside angle to fire them, rather than stepping to the left, being predictable and falling into Martinez trap. If Sergio took an outside angle, he was getting jabbed and hooked. If he decided to take his normal inside angle, Miguel Cotto was prepared to counter and pivot out. It was a carefully considered masterclass in how to fight a southpaw, one that far more boxers, muay thai boxers and MMA fighters should be watching. It goes without saying that there is more to this performance than just this brief look. This performance came from a lot of patience and discipline both in and outside of the ring.